The African Drumming Ensemble at Eastern is made up of students and community members dedicated to the traditional musics of Western Africa. The group came into existence 15 years ago, and has performed numerous concerts around the Pacific Northwest, including the Seattle Rhythm Festival. 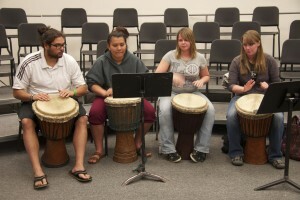 EOU offers two hand drumming classes, a seasoned performing ensemble and a group dedicated to new drummers.